Happy new year fellas… hope you rushed in well. The authors planned to construct the cyclopropane motif at last by employing a nice copper catalyzed cyclopropanation. The phtalan moiety was constructed through a ruthenium catalyzed cycloisomerization and the chain extended by an Arndt-Eistert homologation. So here we start from the very beginning. The alcohol shown was oxidized under standard conditions and reacted with pseudoephedrine to give amide 1. 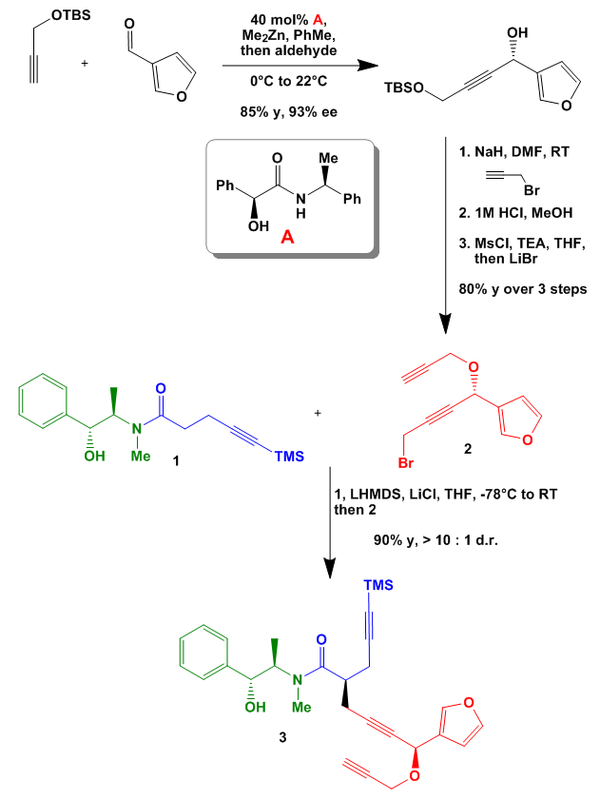 The second main fragment was synthesized through a stereoselective alkynylation using a mandelamide ligand and dimethylzinc. The corresponding alcohol was propargylated, desilylated and exposed after mesylation to Finkelstein conditions to give bromide 2. 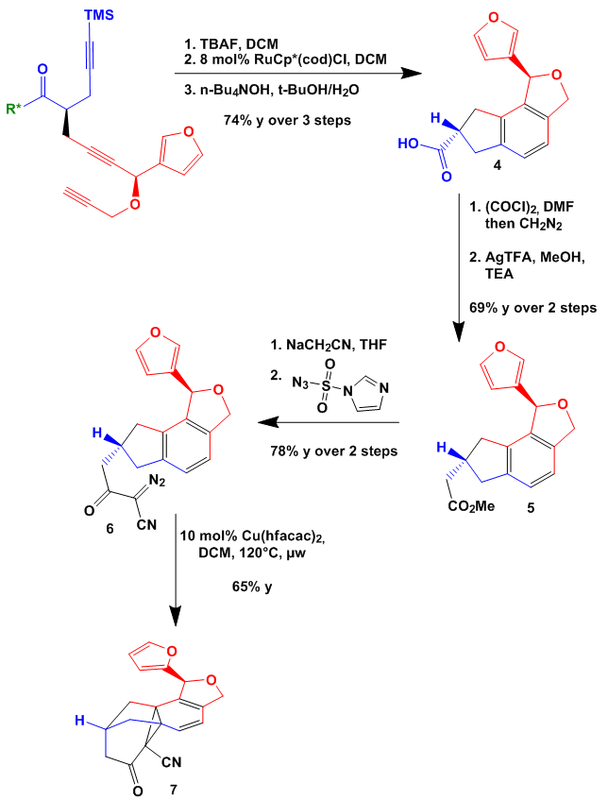 Next fragment 1 was enolized with LHMDS and reacted with 2 to give triyne 3. 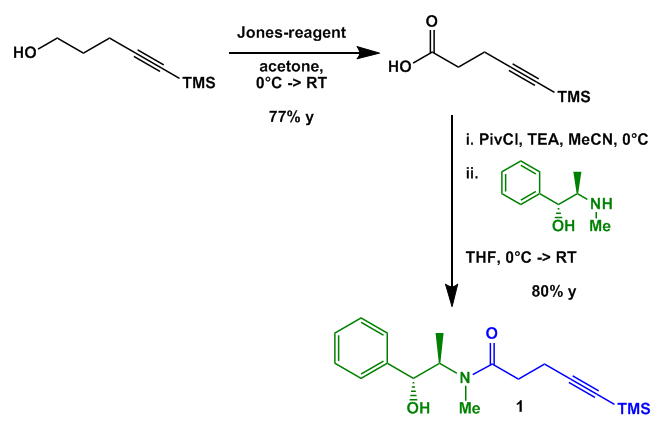 The reaction conditions were developed by the Myer’s group (J. Am. Chem. Soc. 1997, 119, 6496-6511), nice paper btw. Now it’s getting really cool. The triyne was cyclised to the phthalan ring after deprotection of the TMS group employing TBAF. Really nice but I could not figure out exactly which protocol they followed, nothing is said in the paper or supporting info. If anyone of you has an idea you are welcome to forward me the DOI. The auxiliary was cleaved off and acid 4 extended by one CH2 under Arndt-Eistert conditions to give 5. The resulting methylester was reacted with the sodium salt of acetonitrile to give a cyanoacetate which was converted to diazo compound 6. Exposing this to a bit of copper(II) for only one minute in a microwave the cyclopropane ring formed in good yield to give 7. The ketone was then transformed into the enol triflate. 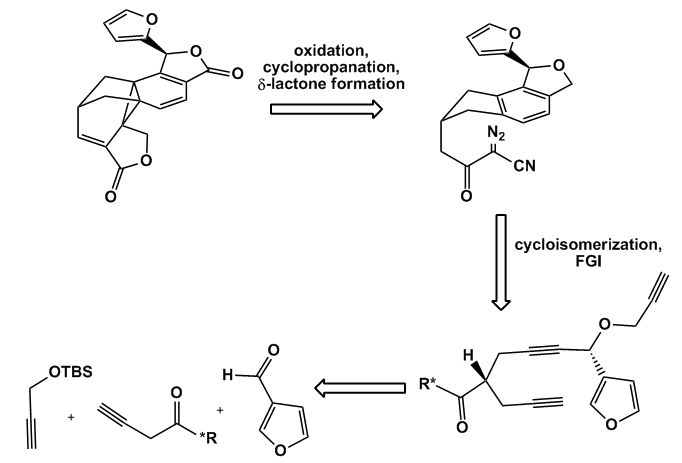 Reduction of the nitrile was not that trivial: the corresponding in situ formed aldehyde underwent a retro-Claisen rearrangement and opened the cyclopropane ring. After some experimentation it was possible to rapidly reduce the nitrile to alcohol 8. 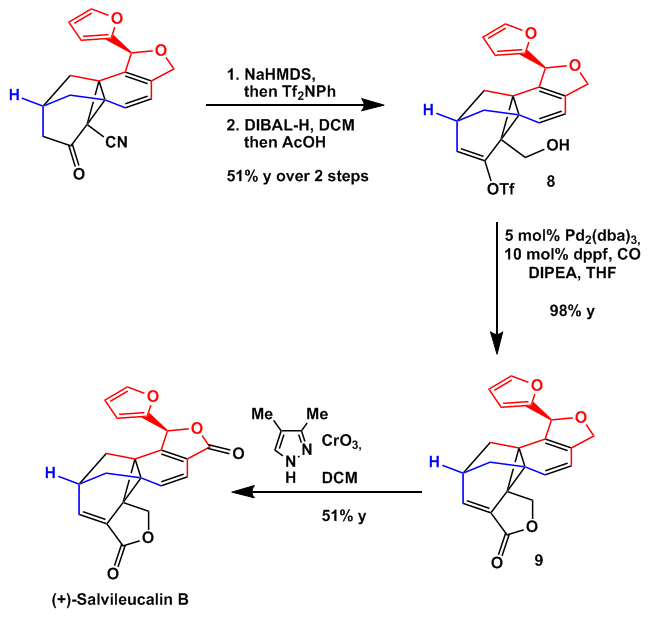 Carbonylation under standard conditions furnished lactone 9 which was exposed to Cr(VI) to give a mixture of products containing substantial amounts of (+)-Salvileucalin B. Short but very effective. I liked the way how the norcaradiene core was built. And especially the cycloisomerization reaction catched my eye.